Ayurvedic herb Shatavari (Asparagus racemosus) has a history of folklore for use in bust enhancement and health. This passage is about the role of Asparagus in health and in breast enhancement. The genus of Asparagus belongs to the plant family of Asparagaceae. Previously, asparagus was classified under the family Liliaceae. Satamuli, Satawar, Satavari, Shatuli, Vrishya, Shatawari, Shatavari, and Rag Samsib are alternate names for Asparagus racemosus. 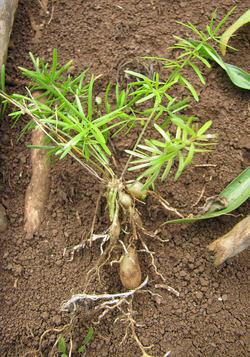 Asparagus adscendens (Shweta musali), and Asparagus gonoclades are less popular for traditional medicinal use in India. Another well known species is common Asparagus (Asparagus officinalis). Shatavari is known as a general health tonic. An added benefit of asparagus, is that its constituents, named Shatavarins, have anti-cancerous properties. Shatavari is often used to promote lactation for the purpose of nursing. At least one study showed an ethanol extract of Shatavari to increase prolactin, which is consistent with its effects on the breast. Another study found that a water extract of Asparagus officinalis roots increased luteinizing hormone (LH), follicular stimulating hormone (FSH), gonadotropin releasing hormone (GnRH), progesterone, and estrogen. Asparagus' hormonal effects are likely circumstantial (as most herbs are) depending on the time of the menstrual cycle. Asparagus use should be beneficial outside of proliferative phase. Through literature, Satawar has similarities to fenugreek and suma. Herbs that raise prolactin with estrogen without raising androgens typically have the potential for a negative effect on the ovaries, and correlate to lowered offspring size. The effects of androgens weren't shown in the studies, because of its underestimated importance, but asparagus raises LH, which raises androgens. Shatavari seems to have a balanced effect on raising hormones. For purposes of breast enhancement, the root from many species of asparagus may substitute Shatavari. Asparagus has a small effect on breast tissue by itself. However, with the right combination with other herbs with varying properties, the potential for breast enlargement can be maximized. The part of Asparagus that is used for herbal medicine is its tubers. Asparagus is better taken in whole form, either fresh, ground or dried, than through extracts. The reason for this is because un-extracted plants, contain fiber that is beneficial for health. Taking asparagus root by itself during proliferative phase is typically counter-productive to breast enhancement. The time of menstrual cycle to take asparagus root is not established. Asparagus has similar hormone raising properties as fenugreek and suma, and is more specific to the breasts, so Shatavari can possibly partially or fully replace fenugreek in the herb schedule. There are different accounts on whether asparagus berries are edible, but it's better to avoid them. Berries of Asparagus curillus (and possibly of Asparagus berries in general) have abortifacient properties. If you have hirsutism, PCOS, hot-flashes, other signs of hormone imbalances, see estrogen-imbalance and treating hirsutism program before trying herbs. See precautions for more details of care to be taken with herb use. Also, check for the latest blog updates about herb and hormone safety. Herb concentrates can be tens of times more potent by weight than herbs in solid form. This can easily lead to hormone imbalances. For this reason, concentrate extracts are not recommended for extended or excessive internal use, especially during fertility years. Concentrates shouldn't be used to overcome plateaus. Another issue with herbal extracts, is that they may not have the full range of properties of the herb. If opting to use herb extracts, use no more than 1 drop at a time, diluted in a food-grade carrier oil (like unrefined olive oil) or water. Biology describes the science of breast development and endocrinology. Symptoms related to hormone imbalances are important to understand. The text from Biology and Hormone Imbalances is in breast-endocrinology.pdf, which uses a Creative Commons license. super-bazongas.pdf continues about herb use, including the potential role of Asparagus, in a herb schedule for breast enhancement. Herb timing and combinations' success for breast enhancement relies on menstrual phases. See programs for examples of herb combination use, and for pictures of successful herbal breast enlargement. Shatavarins (containing Shatavarin IV) with anticancer activity from the roots of Asparagus racemosus. https://www.ncbi.nlm.nih.gov/pmc/articles/PMC3523501/. Plant profile, phytochemistry and pharmacology of Asparagus racemosus (Shatavari): A review. https://www.ncbi.nlm.nih.gov/pmc/articles/PMC4027291/. A Double-Blind Randomized Clinical Trial for Evaluation of Galactogogue Activity of Asparagus racemosus Willd. https://www.ncbi.nlm.nih.gov/pmc/articles/PMC3869575/. Effects of aqueous extract from Asparagus officinalis L. roots on hypothalamic-pituitary-gonadal axis hormone levels and the number of ovarian follicles in adult rats. https://www.ncbi.nlm.nih.gov/pmc/articles/PMC4869160/. USDA: Asparagus classification profile. http://plants.usda.gov/core/profile?symbol=ASPAR. 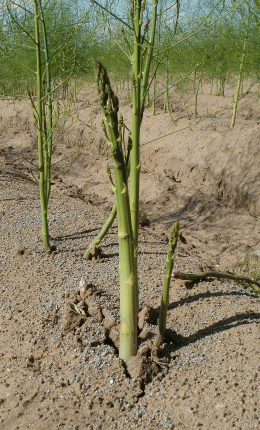 U.S. National Plant Germplasm System: Asparagus racemosus. https://npgsweb.ars-grin.gov/gringlobal/taxonomydetail.aspx?id=5540. Biological Activities of Asparagus Racemosus. https://www.ncbi.nlm.nih.gov/pmc/articles/PMC2816549/. Chemical constituents of Asparagus. https://www.ncbi.nlm.nih.gov/pmc/articles/PMC3249924/. 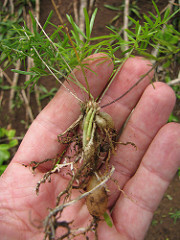 Image of asparagus tuber is by Forest and Kim Starr; (CC BY 4.0). 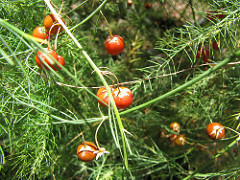 Image of asparagus berries is by Forest and Kim Starr; (CC BY 4.0). Image of asparagus seeds is by Forest and Kim Starr; (CC BY 4.0). Picture of asparagus field is in public domain, retrieved from Pixabay.